There are more than 40 different kinds of gulls throughout the world. They range from one that measures about 11 inches, head to tail, to the largest ones that are almost three times that size. The gulls on the northern Pacific coast are some of the larger varieties. As a very general rule, the further north one goes, the larger the size of the bird will be in order to preserve body heat. Out of those 40 species in the world, we see about ten in the Pacific Northwest, although other species will occasionally wander through during migration. Even though identification is difficult, you may be able to identify some of the more common ones. You’ll experience the same pleasure that you get in being able to call someone by his or her first name as well as last. One of the reasons that identification of species is so difficult is that immature gulls–gulls less than three years old–look so different from adult birds. They’re usually quite dark the first year, lighter the second year. 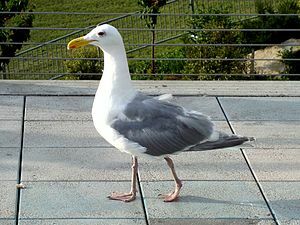 If you see a dirty-looking gull, brownish gray over much of his body, you are most likely looking at an immature gull. Another difficulty is that plumage varies in the winter in some species. 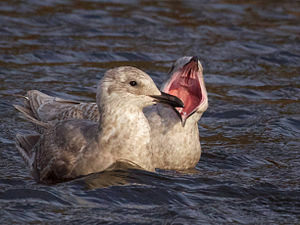 There is no noticeable difference between male and female gulls, although males tend to be somewhat larger. 3) Pattern and contrast in wings and wing tips. Remember that when the gulls are on the ground the wing tips fold back onto the tail. A description of some of our more common gulls follows. Your best help in identification would be a complete bird book. Several good ones are listed at the end of this book…..
–from Keepers of the Beach: Gulls of the Pacific Northwest, under my former name, Mary Lynn Seavy, Welcome Press, Seattle, WA, 1981, now out of print.